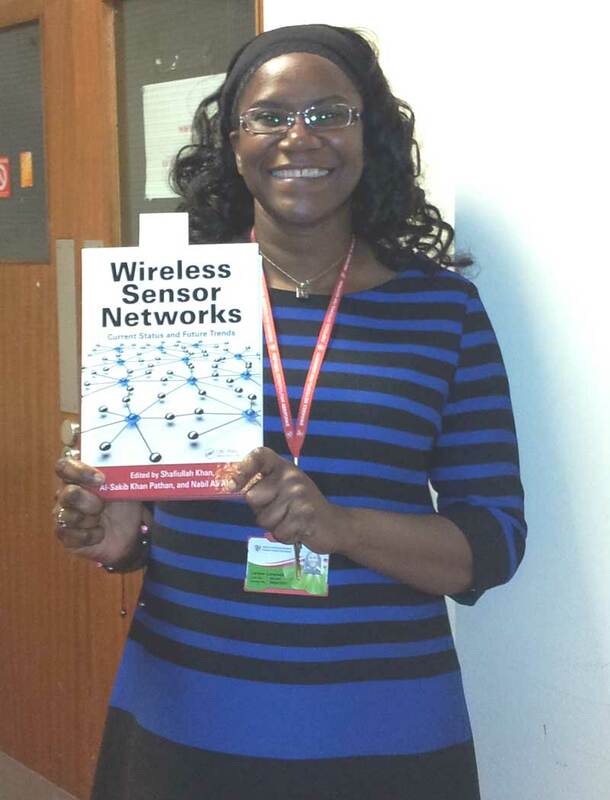 Congratulations to Dr. Carlene Campbell a member of the School’s Lecturing Team who has recently published a book chapter and paper on the use of Wireless Sensor Networks. The book is titled Wireless Sensor Networks: Current Status and Future Trends and is published by CRC Press. It looks at the various issues associated with Wireless Sensor Networks (WSN), including their structure, activities and applications. The chapter looks at the Medium Access Control (MAC) layer, where it focuses on the design of multichannel communication based on the 802.11 Distributed Coordinated Function (DCF) to improve its communication in WSN. The Paper entitled “Multichannel Framework for Body Area Network in Health Monitoring” proposed a novel multi-radio multi-channel framework for efficient communication among devices in wireless body area networks (WBAN). the focus is to ensure energy efficient and reliable communication in WBAN.